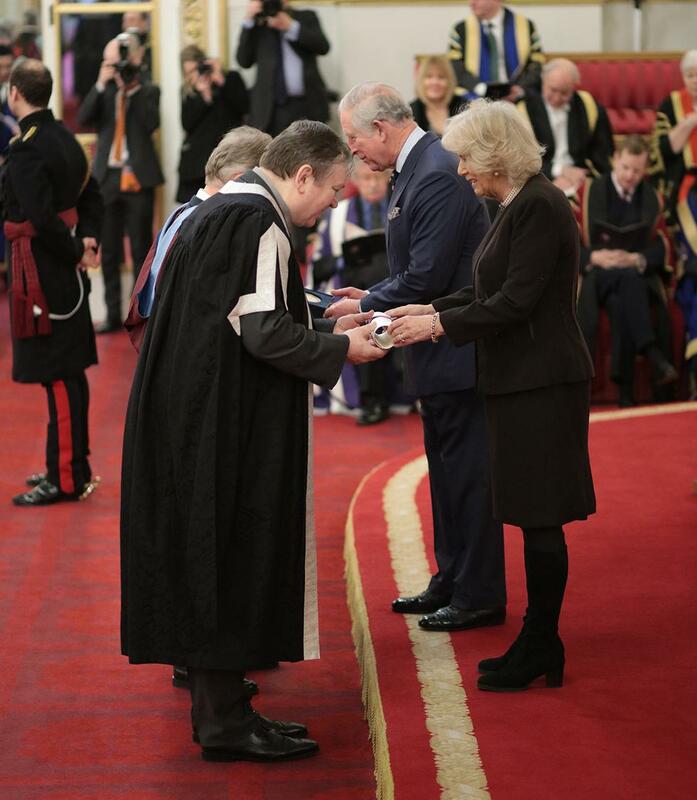 Professor Sir David Payne led the University's delegation to Buckingham Palace. A delegation from the University of Southampton has visited Buckingham Palace for ceremonies to receive the prestigious Queen’s Anniversary Prize for Higher and Further Education. The Prize, awarded for the University’s world-leading expertise in photonics and fibre optic technology, was presented by HRH Prince Charles and Southampton Honorary Graduate HRH the Duchess of Cornwall to Professor Sir David Payne and Professor Nikolai Zheludev from Southampton’s world-renowned Optoelectronics Research Centre. The Queen's Anniversary Prizes are the UK's most prestigious form of recognition for a UK academic or vocational institution, with approval directly from The Queen and Parliament. 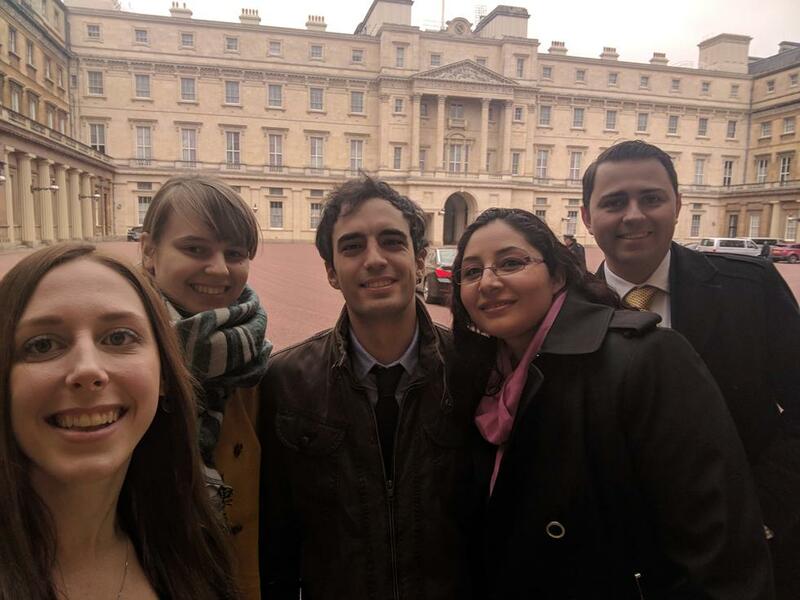 Also representing the University at the Palace were Philip Greenish, Vice Chair of Council, Research Fellow Dr Katrina Morgan, PhD researchers Andrea Ravagli, Alex Jantzen, Angeles Camachoand Ausra Cerkauskaite. Inspired innovation by the ORC over many decades has led to the development of a vibrant community of over 200 staff and postgraduate students working on cutting-edge research in photonics – the science and technology of light – to provide solutions for real-life problems. Formally established in 1989, the ORC is now the largest and longest established centre of its kind in the UK, leading breakthroughs in optical fibres, laser manufacturing, next generation computing and new optical materials that power the internet, feed mobile telephone networks and help make life-saving devices that transform our daily lives. As well as its extensive links with companies and universities around the world, the ORC leads a new national manufacturing hub for the UK. It has also been responsible for developing a major research and commercial nucleus within Southampton and the surrounding area with at least 10 companies ‘spinning out’ to provide employment and inward investment to the region from its work. Outreach activities have also been a hallmark of the ORC with schools and colleges benefitting from activities designed to encourage more students to study physics and support the teaching of photonics in schools whilst engaging them in research and the wider promotion of careers within physics and engineering. Activities including the Photonics Explorer workshop and The Light Express Roadshow reach thousands of school-age pupils and students each year. “Over fifty years ago the ORC received global recognition for developing one of the world’s first ultra-low loss optical fibres,” said Sir David. “From there we were the first to announce another vital component that allows the internet to span the world, the optical fibre amplifier that periodically boosts the signals. Today hundreds of millions of kilometres of optical fibre carry the signals on the internet. Professor Nikolai Zheludev with Southampton Honorary Graduate, HRH The Duchess of Cornwall. ORC Research Fellow Dr Katrine Morgan with PhD researchers Andrea Ravagli, Alex Jantzen, Angeles Camacho and Ausra Cerkauskaite. 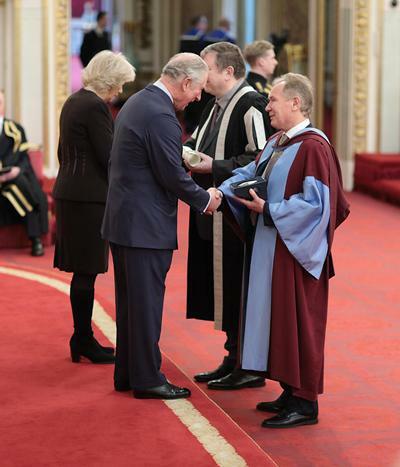 ORC Director, Professor Sir David Payne, receives the Queen's Anniversary Prize from HRH Prince Charles.